Hi readers! It's time for my quarterly blog post. Hahahaha! I have not totally given up blogging, I just can't seem to find time for it lately! :) I promised you back in May that I would update you on the new playroom for Georgia. Here I am to keep my promise. Michael and I decided earlier this year to move our office to the den so that we would have a space farther from Georgia's bedroom where we could hang out after she went to bed. It was so hard creeping around upstairs in the office when she was sleeping right next door! Michael also wanted a bigger area for his VR gaming setup. So after much discussion, we finally decided to move the office to the interior wall of the den. We had to rearrange a little bit and I lost half of my sewing room, but gained a "roommate" downstairs! We have been loving the new arrangement. It's great to have us both in one space for his gaming and my projects. Plus, we have the den side with the couches and TV so we can watch Netflix at night without worrying about how loud the volume is! We call it "our studio apartment" like it's our adult hang out space. Meanwhile, we converted the old office into a playroom for Georgia. Hopefully in the not-to-distant future we can get rid of some of the toys and make the room into a guest room/reading room with the addition of a daybed. But for now, it's host to Georgia's wonderland of toys. Here's a look at the new space. The back wall of the room features a chalkboard wall that I painted. Everyone has such fun drawing when they come to visit. Georgia enjoys the freedom to scribble and draw big circles (with supervision). Michael and I doodle occasionally, too! And hark! The return of the denim chair! 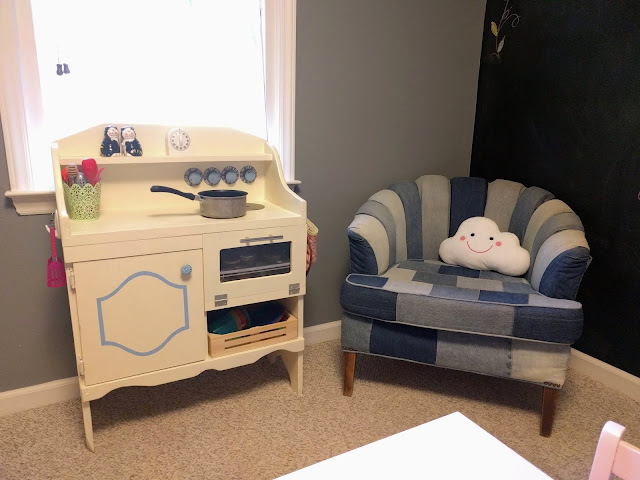 We needed an adult-sized place to sit in here and since the gray velvet chair had gone to live with my mom already, I asked for the denim chair back! It's perfect for the playroom. And the little cloud pillow came from Hobby Lobby. 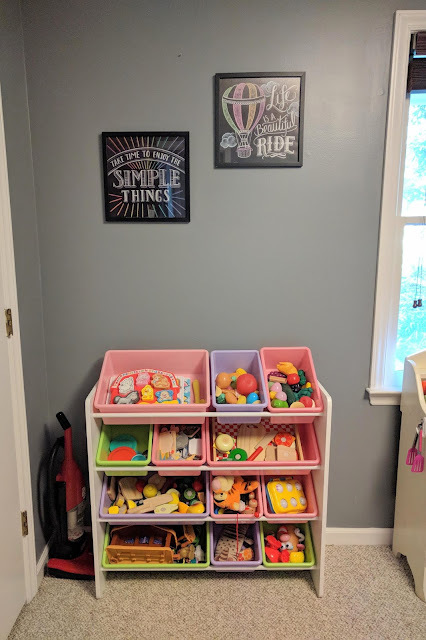 Next to the kitchen is a toy organizer filled with all the kitchen essentials, plus random playsets and puzzles. The wall art is from a chalkboard calendar that I had been saving for years. Finally, the perfect spot to display! Next to the closet of requirement (currently filled with office paraphernalia, board games, and miscellaneous extra toys) is the bookcase which is hosting toys and books of every genre. And in the middle shelf, a supermarket! haha! Check back for more updates from the Horvath House. I still have the big den/sewing room/office reveal. Plus holiday season is approaching so hopefully I'll have time to share some seasonal updates with you,too! The chalkboard wall is even cooler in person. Would have a dream come true when your mom and I were kids! So pretty!